Products to keep an eye on for your design schemes this July! This month we’re sharing another selection of products that will be sure to enhance your interior (or exterior) designs! Whether that be introducing the finer details when it comes to contemporary bathroom spaces with elegant tapware, solid brass handles to add an industrial-style finishing touch to your cabinetry; or maybe you’re looking for more of a statement piece to modernise a garden scheme or brighten up a staircase in a bold and beautiful way. Inspired by the process of gem cutting and setting, the Lapis side table draws on the concise forming, positioning and clasping of the stones. An elegantly crafted teak array is seized by a sinuous structure, presenting the table surface in the same manner a ring presents its precious stones. 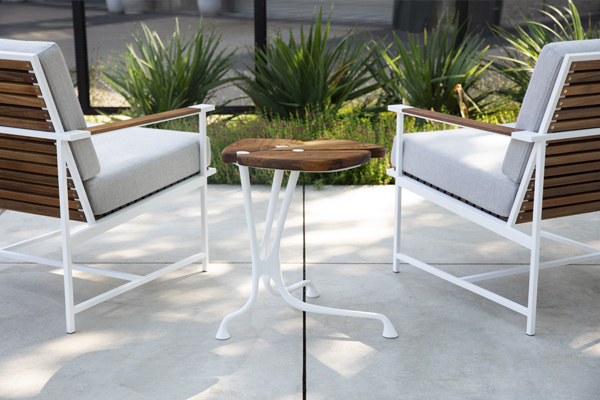 This unique side table is truly transitional perfect for both exterior and interior environments. The Lapis side table aims to excite and inspire interior designers to consider the outdoors as an extension of their stylish interiors. 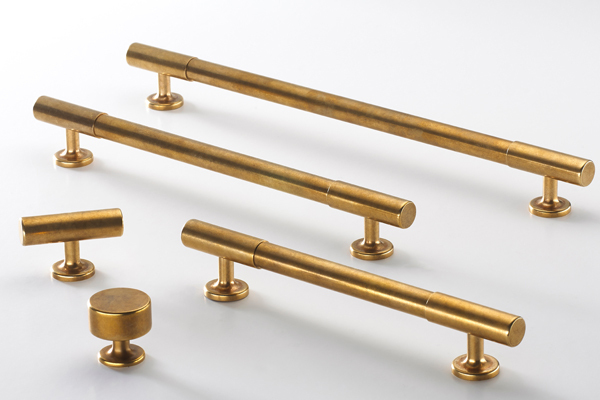 The brand new Kingsheath Collection from Armac Martin is manufactured from solid brass in their Birmingham-based factory. The collection is made up of one size of knob, a t-bar handle, three sizes of cabinet pulls and an appliance pull. Perfect for all interior cabinetry, the design has a simplicity that exudes a modern and industrial look. Stocked in polished nickel finish but available to order in twenty-one different finish options, ranging from burnished brass (as photographed) to antique copper and american bronze. 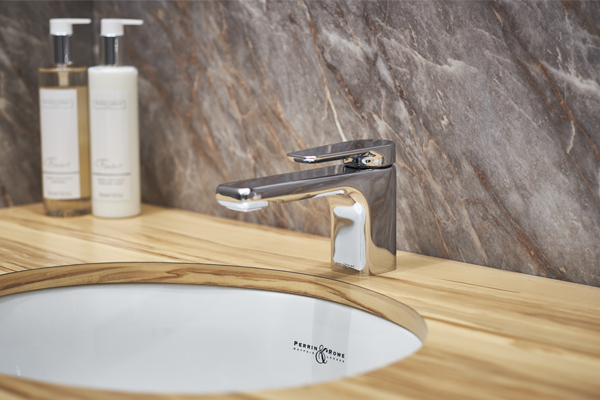 Perrin & Rowe’s new collection for bathrooms is elegant and refined, defined by a slim spout and soft, curved lines. This fresh take on contemporary design is complemented by a traditional approach to manufacturing, enhanced by state-of-the-art technology. A true blend of old and new. The Hoxton range offers a sleek and stylish bath-shower mixer, shower set, basin mixer and accessories including a robe hook and towel rails. Customers can choose from three luxurious finishes – chrome, nickel and pewter, with four other special finishes available to order, including timeless on-trend satin brass and opulent 24 carat plated gold. Nulty Bespoke design bespoke handcrafted luminaires for exceptional spaces. 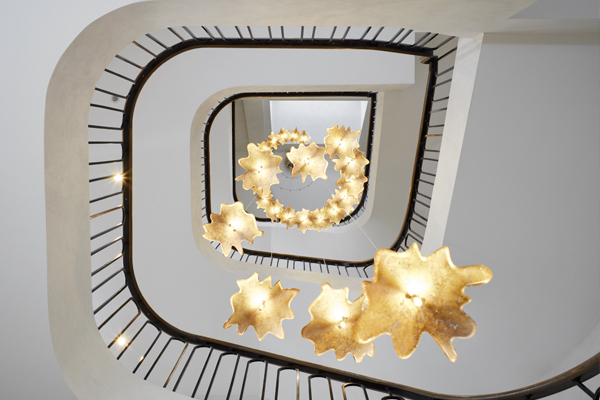 The Flora Pendant is one of their latest bespoke designs, a tailor-made contemporary stairwell chandelier which would create a dramatic statement feature, while adding warmth to the reception room of the luxurious family home on Lonsdale Road in the heart of Notting Hill. Their role was to take the interior designer’s concept for the stairwell’s statement installation and turn it into a reality. 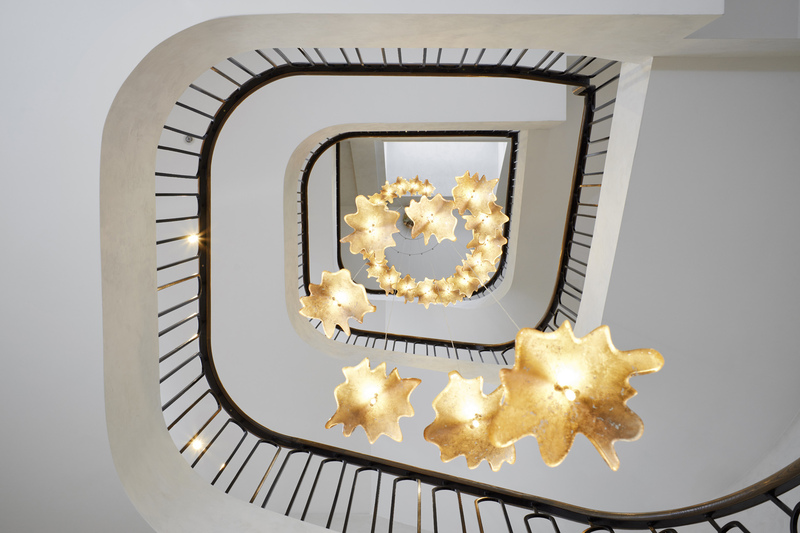 Inspired by natural forms, a spiral of light from 24 petal-shaped shades now gently cascades through the three-storey stairwell. The floating, sculptural quality of the chandelier adds visual interest, complementing the muted backdrop of polished plaster walls, wrought iron balustrade and oak handrail, bringing a bold and beautiful dimension to the hallway for welcoming guests. With their experience in luminaire design and in-depth understanding of manufacturing processes, Nulty Bespoke offer beautiful lighting solutions of the utmost quality. Cosentino is a global, family-owned company that produces and distributes high value innovative surfaces for the world of design and architecture. It works together with its clients to provide solutions that offer design and value, and inspire the life of many people. Their technologically advanced surfaces allow the creation of unique environments and designs for the home and public spaces. The colours of the new Eternal series are inspired by the world of natural stone. For this reason each slab includes a personal variation of veins and colour to turn every slab into a unique piece. This collection gathers the magnitude of natural resources associated to Silestone attributes. Eternal represents the endless beauty and elegance in time, presenting the exclusivity and originality of nature itself. 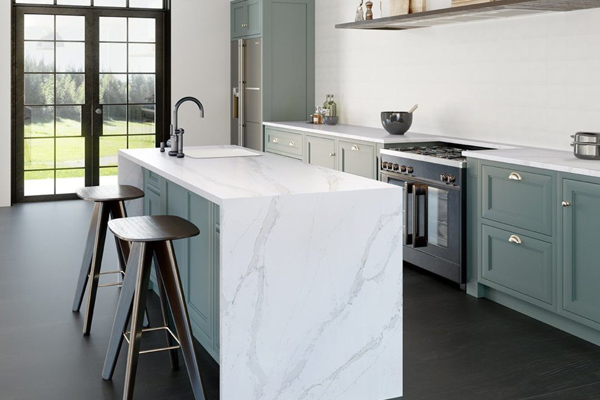 Designs within the collection include Classic Calacatta, Calacatta Gold, Bianco Calacatta, Serena, Classic Calacatta, Desert Silver, Marfil, Emperador, Statuario, Marquina, Charcoal Soapstone, Pearl Jasmine.